This guide will teach you everything you need to know about snowboarding in Chile. Let’s get started, Chile snowboarding season kicks off in June! Welcome to the Southern Hemisphere, where the snowboard season in Chile runs from mid-June into October. On big winters, (hola El Niño) the season can open in mid-May, building bases well into later October. With a splitboard and a sense of adventure, you can tour the backcountry zones and southern volcanos well into November. 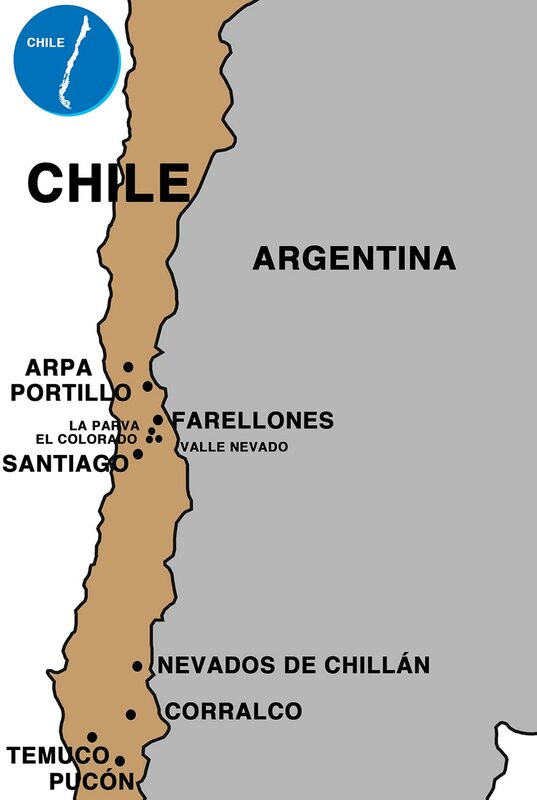 Getting to Chile is quite simple. From USA and Canada there are overnight flights into Santiago, Chile (SCL airport code) arriving early morning the following day. You can be shredding easily by lunchtime depending on where you decide to book your snowboard trip. Check out Hopper or Google Flights for airfare deals. Arriving from Europe involves a flight across the Atlantic into Santiago (SCL airport code). Direct flights from Madrid, London, Paris and more. From Australia and NZ, the flights are obviously a bit longer and you will deal with some jet lag, but it’s all worth it once you hit the snow line. Direct flights via Quantas. Now that you know how to get here, let’s explore some of the best resorts for snowboarding in July, August, and September. Here we’ll cover the best snowboarding destinations in the mighty Chilean Andes. We also include a link to a suggested guided snowboard trip to make the most of the area while visiting. Let’s start in the deep south, known for mystical smoking volcanoes drenched with a deep snowpack and fun natural terrain carved by ancient lava flow. Pucon is a small southern town with wild bars and one of the most famous active volcanos known to the snowboard universe. Arriving into this village you’ll be blown away with the Villarrica volcano that will dominate practically every vista from town…that is when the sun is out. Climbing via hiking or splitboarding the volcano to get to the active, belching crater is an undeniable reason to fly halfway around the world. You can stand on the rim of the volcano and see Argentina and a handful of other massive volcanoes including Lanin, Mocho, Lonquimay, and more. If you are looking for suggestions on where to snowboard in September, this is probably the spot along with Corralco and Chillan. September = weather and a good mix of spring and winter snow conditions. Come to Pucón for the crater, but if you don’t get that, you’re guaranteed for a great party in this mountain town. It’s the old spot with a new jam! Sure the lifts are kinda slow and there isn’t much of a town (although this is quickly changing), but this is what makes it awesome. Endless splitboarding options and one of the only places in the world to snowboard in an Araucaria forest (Monkey Puzzle trees) and summit a volcano the same day. The volcano Lonquimay is also the hotspot for snowmobile accessed snowboarding in Chile. Come to Corralco and get on the short list of people that are in the know. It’s only a matter of time before Corralco is on the radar as one of the top Chile snowboard destinations. Nevados de Chillan: A Snowboarding Paradise? 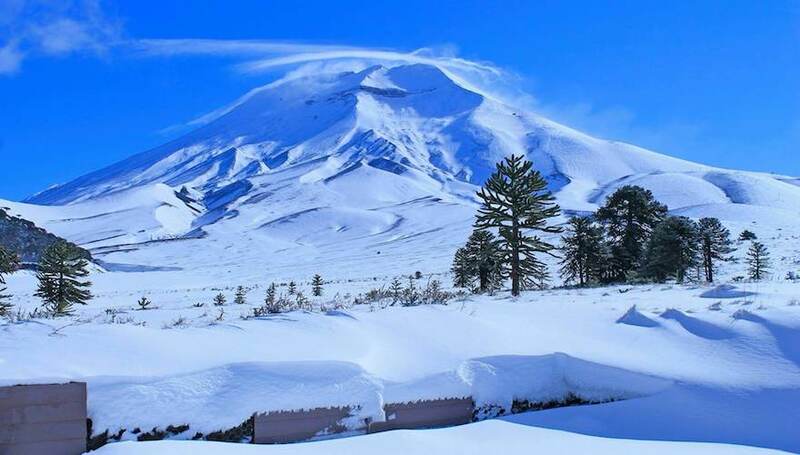 When asked where to snowboard in the summer, we usually point them to The Nevados de Chillán resort area, located 5 hours south of Santiago via train or car or via a short flight to Concepcion. It is well worth the journey from the northern resorts. If you are going to snowboard Chile, you cannot miss Nevados. The historic Valle las Trancas used to be a (literally) guarded-by-gate outlaw’s haven. There used to be only a clandestine casino on the flanks of the active volcano; a volcano that just happened to have amazing, light and dry powder and fun tree riding. Nevados de Chillán and the Las Trancas valley has since evolved into an adventure tourist’s paradise. With lifts taking you right up to the base of the volcanos, some people say it is like snow surfing on the moon. Epic views, natural lava-tube halfpipes, buffed out wind lips, and splitboard touring options for days. You can get even get some urban snowboarding in as the hotel is quite liberal when it comes to using their hotel for rails, etc. The photo above is from a Dakine Snowboarding shoot PowderQuest ran a few years back. Rider Elias Elhardt showing how it’s done. Looking for a fun backcountry snowboard trip? If we had to choose one place to go splitboarding in Chile, that is accessed via a ski resort, this is the spot. With the fun, beautiful, and quaint Las Trancas, just 6 miles down the road from the resort, you’re guaranteed to meet people from all over the world who love to travel and ride. Chile’s Tres Valles (Three Valleys) area towers above Santiago. If you are searching for snowboarding near Santiago, these three resorts are the closest to the city and airport. Within 45 minutes from touching down on Andean soil, only the looming 75 hairpin turns separate you from forgetting all the woes of airline travel. A high alpine freeride paradise awaits you in the form of three awesome snowboard destinations: La Parva, El Colorado, and Valle Nevado. La Parva, known for its backcountry access and historic zones like “McConkeys” and “La Chiminea” has plenty for everyone: playful terrain, fun groomers, and the options to hike or split board, getting you much, much steeper. This resort is all about the backcountry snowboarding access via the lifts. If you have a splitboard, you can get way out there to some world class lines. Just be prepared, the altitude can be tough to deal with until you are acclimated. The neighboring resort is El Colorado. 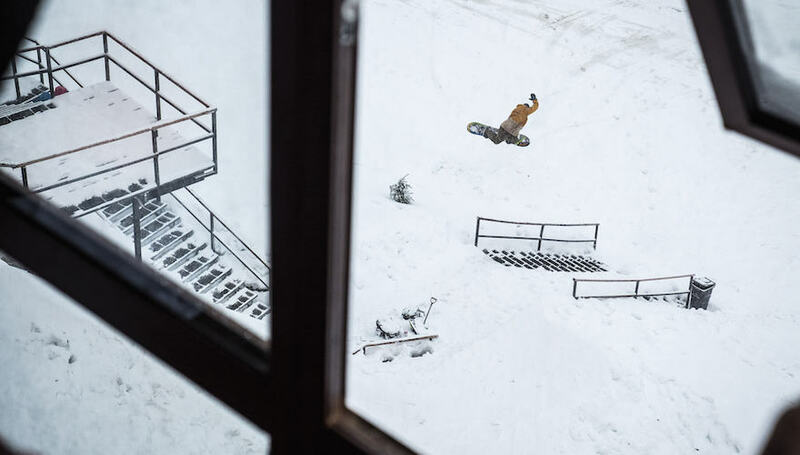 It’s the closest resort to the town of Farrellones, the village that you’ll most likely call home while visiting this triple-threat mecca of shredding. El Colorado is home to access point of the backcountry area known as Santa Teresita. Amazing pure powder fall-lines, cliffs and some of the best chairlift/road accessed backcountry in South America. The all time famous resort, Valle Nevado is the final link. One of the most well known centers in South America with its full modern services, snowboard terrain park and the option of heli-boarding to some of the best terrain in the Andes. A splitboard will get you deep into the high Andes as well, but be prepared for some long approaches. The rewards are there however, as the descents are some of the best in central Chile. You could debate on whether or not Portillo should be on this list. After all it is a skiers mountain. Always has been and always will be. Some snowboarders hate it, but others love it. If you are a beginner or intermediate this is a great resort due to the wide open and well maintained slopes. You can quickly jump off the trail for some fun powder turns before getting back to the groomers. Experts with good mountain sense and a hunger for adventure will also love Portillo. Why? For the hiking access to some seriously steep terrain and cliff drops. Just be prepared for some exposed traverses. The grey area is with advanced intermediates to advanced snowboarders. You may find you quickly become limited on terrain you can ride. Most of the expert terrain requires steep sling-shot style lifts and traverses over rocky cliff bands. Unless you are experienced in the mountains, this terrain should be avoided. So what do you do? Make a day trip of it and enjoy the best of the resort. Guided trips visiting multiple resorts, include day trips to Portillo. A great option to experience Portillo, but not feel like you spent too much time there. Now that has been cleared up, here are some more reasons to consider a visit. We think you should go snowboarding in Portillo for a few reasons, the most basic is the stunning beauty. Located in the same Andean sub-range as South America’s tallest peak, Aconcagua, the Laguna del Inca has got to be, hands down, one of the most beautiful backdrops you can imagine. It’s practically distracting while you’re trying negotiate the area’s steep runs. This is the area’s best feature. Unobstructed steep and steeper fall lines. If you plan on riding some of this expert terrain, be sure to read our “note to snowboarders” on our detailed Portillo resort review page. Portillo was founded in 1949, which means that this place has seen its handful of snowboarders over the years. One of the things that makes this place special is the set up of the terrain. The two sides of the valley above Lago del Inca is “in-bounds” terrain. There are lifts on both sides, and with a simple “further is fresher” attitude, a short traverse means it’s likely you’ll be riding fresh powder for weeks after a storm. As well, who wouldn’t want to try their hand at a 5-person poma style lift known as the Va Et Vient on the infamous Roca Jack. On PowderQuest guided snowboard trips to Chile, we keep this location a short stop. Most guests only need one day in Portillo to get the feel of the resort, but we can always arrange more if you are looking for something more exclusive.